Significant Battles in Scottish History - Scots Connection. Publius Tacitus, the historian of the Roman Empire, recorded that Gnaeus Julius Agricola, when Governor of Britain, marched on and defeated a great force of Caledonians in an as yet unidentified location between Strathmore and Moray. The Romans, with 8,000 infantry and 3,000 cavalry, were allegedly greatly outnumbered, the strength of the Caledonians being estimated at 30,000. After this event it was claimed that Agricola had finally succeeded in subduing the tribes of Britain. Such information as exists comes from the chronicles of the Venerable Bede, a Northumbrian monk who lived at the start of the 7th century. The location of this battle is thought to have been in Liddesdale. The Venerable Bede tells us that King Aidan of Dalriada was defeated by Ethelfrith of Bernicia, King of Angles, and almost all of the Gaels taking part in the action were killed. Near Forfar, in Angus, King Brude of the Picts defeated Angles under Egfrith, King of Northumbria. 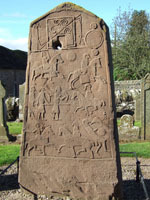 In today's East Lothian, Angus (or Oengus) King of Picts is said to have won a great battle against Athelstane, King of Northumbria. Tradition has it that on the eve of the battle, King Angus prayed to Saint Andrew, Patron Saint of Scotland, and, the following morning, a cross of white cloud against a blue sky was seen. According to Walter Bower, a Scots Augustinian monk (1385-1449), King Athelstane fled from the battlefield, but was killed close to today's village of Athelstaneford, where now stands the Scottish Flag Heritage Centre. Legend also has it that he was decapitated and his head placed on a pole on an island in the Firth of Forth. However, a major dilemma exists concerning Bower's account in that a King Athelstane is also on record as having existed at the end of the following century, and that he won a great battle against the Scots under their King Constantine at Brunanburh (see below). This King Athelstane, a grandson of Alfred the Great, was allegedly the first King of all England. In 937, King Constantine II of Alba invaded England with Welsh and Danish support and, according to the Annals of Ulster, was conclusively defeated. The exact location of the battle is unknown but it is thought to have been on Merseyside. This battle was fought at Carham-on-Tweed in England between the Scots, led my Malcolm II and Owen of Strathclyde, against the Northumbrian army. The ensuing Scottish victory established Scotland's possession of the Lothians. Writing in the 16th century, John Bellenden (or Ballantyne), Archdeacon of Moray and Canon of Ross, makes mention of a Scandinavian invasion being repelled by Macbeth in the vicinity of Kinghorn in Fife, but detail and confirmation are illusive. This was the confrontation in Aberdeenshire where Macbeth was killed by Malcolm Canmore with the support of the Saxon King Edward the Confessor. Canmore was determined to avenge his father, Duncan I, who had been killed by his own men led by Macbeth in 1040. In William Shakespeare's politically expedient version of the story, the battle takes place at Dunsinane, north of Perth. Having ruled as King of Scots for just over six months, the 25-year old Lulach, Macbeth's stepson, was killed by Malcolm III in a confrontation in Strathbogie. In support of his niece, Matilda, who claimed the English throne in opposition to the incumbent King Stephen (who was married to another of his nieces), David I of Scotland marched an army to Cowton Moor in Yorkshire and was heavily defeated. King David and his surviving force fell back to Carlisle where they re-grouped and a truce signed within a month. The most significant event of the Scottish Norwegian wars of the 13th century. The Norwegian army was led by King Haakon, and the Scots by Alexander III. The Inner and Outer Hebrides, Kintyre, and the Isle of Man, had paid homage to the Kings of Norway since around 1110. When news reached Haakon that the Scottish king was planning to seize his territorial possessions, he set off with a mighty fleet of ships and joined forces with King Dougal of the Hebrides and King Magnus III of Man. Having raided the coastline, however, Haakon moved south to the Firth of Clyde on the West Ayrshire coast where he was attacked by a large Scottish force, estimated at around 8,000 men. Although claimed as a Scottish victory, the ensuing skirmish simply culminated in both sides retreating. Winter was approaching, and Haakon sailed to Orkney, planning to return in the following year, but he fell ill and died on 15th December. Two years later, King Alexander successfully invaded the Hebrides and negotiated with Haakon's successor, King Magnus. Under the Treaty of Perth in 1266, Scottish sovereignty was purchased in return for 4000 marks and an annual payment of 100 marks in perpetuity.